A sprint coach never sleeps. How many times have you heard a sprint coach whine about their banged-up sprinters. Up and then down, happy and then sad, excited and then bored, fast as lightning and then injured. Kids just aren’t as tough as they used to be. Ha. What percentage of our state’s fastest kids fail to survive the season? Does the fastest car with the best driver always win the race? Does the most experienced jockey riding the most expensive thoroughbred always win the derby? Does the expert sprint coach with the fastest sprinter always win gold? The answers are beyond simplistic. The mechanic may be more important than the race car driver. The trainer of a racehorse may be more important than the jockey. Muscle activation may be more important than the sprint coach. Sprint coaches lose sleep. Keeping sprinters fast without a glitch is nearly impossible … especially if your training plan does not include a mechanic. 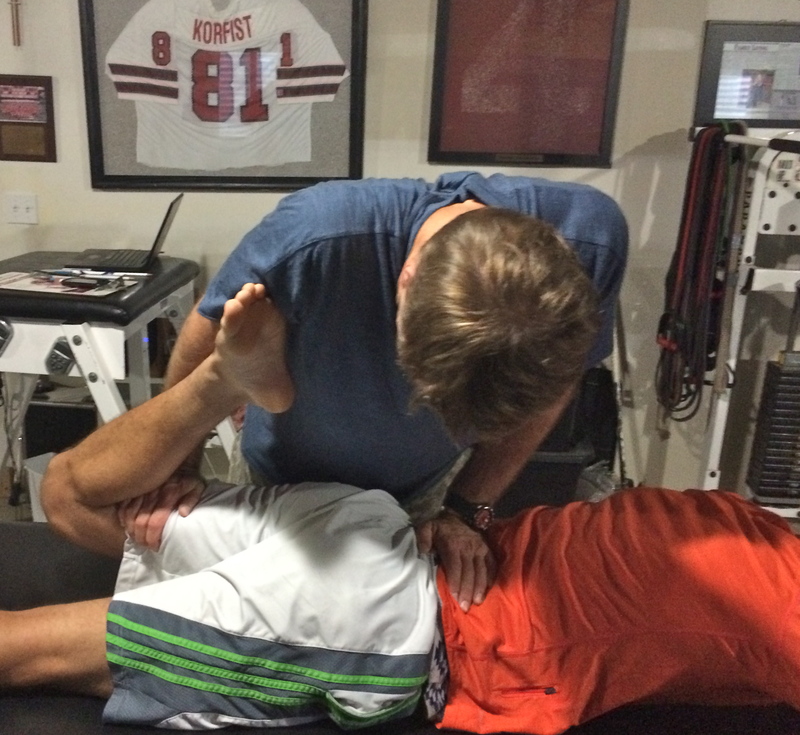 I recently wrote an article for Freelap USA, “Hamstrings, Activation, and Speed“. If you haven’t read it, you probably need to do so. You are now reading the sequel. To summarize to those who have not read it, my last article introduced “Be Activated”, a muscle-activation program by Douglas Heel from Cape Town, South Africa. Chris Korfist is a disciple. The body is complicated. Sprinting is accomplished by the multiple muscles working in sync and in harmony with each other. If any link in the chain is deactivated, problems occur. Let’s cut right to the chase here. Hamstring problems are NOT the result of weak hamstrings. Case in point … Isaiah Michl of Edwardsville. 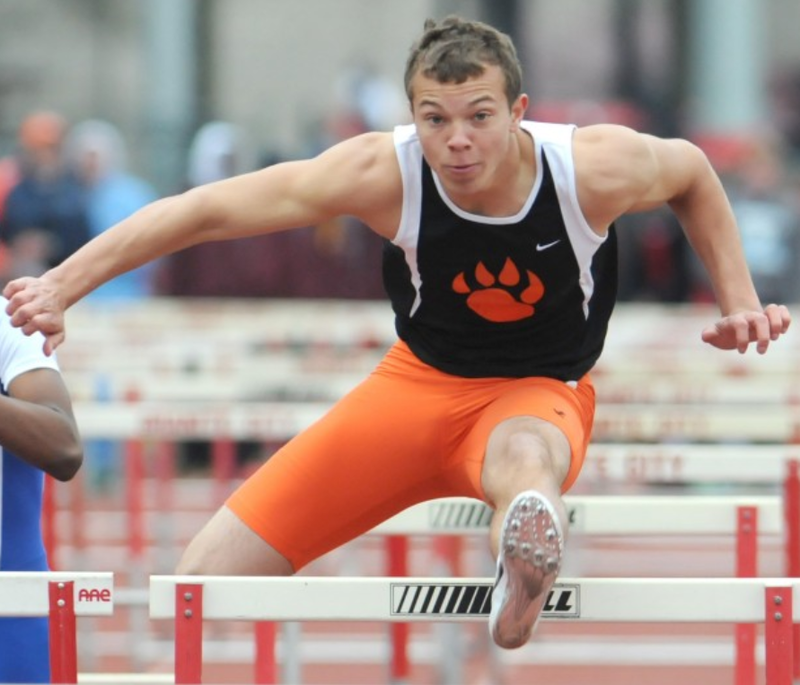 Isaiah Michl is a terrific sprinter, hurdler, and wide receiver. Isaiah ran 14.58 in the highs and 37.99 in the intermediates last year as a junior. However, both of those times were achieved on Saturday, April 12th. Two weeks later at the Penn Relays, Isaiah started complaining of “hamstring stiffness”. There was no apparent injury. The genesis of the pain could not be determined. A sprint coach never sleeps. So what do we do with a sprinter that has a hamstring issue? Rest? Ice? Massage? Hydrate? Stim? Ibuprofen? Naproxen? Ultrasound? Stretch? Isaiah Michl tried everything. At conference, sectional, and state, he ran through the pain. He fought the tightness. He put his team first and did his job. Michl was a member of Edwardsville’s state championship 4×1 team (41.46). In addition he placed 5th in the intermediates running 38.29. Isaiah Michl has a left lead-leg in the hurdles. His problems with his left hamstring (actually his left glute and groin as your read on) made his problems more pronounced. Without the injury issues, how fast would he have gone? Click to enlarge. The hamstring issue has stayed with Isaiah Michl for six months. Football has been a continuation of track. Hamstring issues can take the fun out of track and football. How can you train at top speeds with constant soreness? At the University of Illinois football camp, Isaiah Michl was timed at 4.33 in the 40. Despite the problems, Michl has been a star receiver on one of the best football teams in the state of Illinois. In the past three seasons, Edwardsville is 26-4. Recently Edwardsville hammered perennial powerhouse East St Louis 57-32. Edwardsville made a statement in week-2 at 8A #1 Loyola. Edwardsville never trailed in the game until the final play, losing 29-28 in an overtime classic. What a catch! 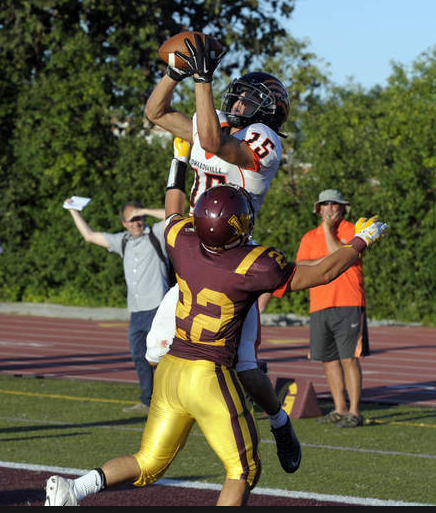 Edwardsville led #1 Loyola 21-0 early and 28-21 in OT before losing 29-28. The 300-mile bus ride by Edwardsville makes the performance even more remarkable. Click to enlarge. Like all sprint coaches, I get it. I understand the miserable uncertainty. Chris Korfist is a speed guru with a new hobby. The hobby is called “Be Activated”. To understand more, you need to read my last article. I’ve encouraged my son, Alec, to consider bringing Isaiah to Burr Ridge for a Korfist visitation. Last Saturday, they made the long trip to Plainfield. On Sunday morning we spent almost two hours with Chris Korfist. Chris Korfist did strength testing and found the problem within minutes. Isaiah Michl had a left glute and groin muscles that were deactivated. His hamstring was perfectly strong and functioning at 100%. After activating those deactivated muscles, everything was miraculously in sync. I’ve watched this done to several athletes and I am a convert. I only know the tip of the iceberg but I will know more soon. Chris went on to activate and check Isaiah thoroughly. When Isaiah got off the table, Chris asked him how he felt. With a big smile on his face, Isaiah replied, “I feel tall”. Isaiah went on to admit that he had no confidence that activation would work. He had been to massage therapists who worked tirelessly on his hamstring but nothing had changed. All that work done on Isaiah’s hamstring was a waste of time. Activation was not a waste of time. When we went out to the street to allow Isaiah to test drive his newly “fixed” muscle chain, everything functioned well. Alec had described Isaiah Michl as having a “herky-jerky crazy-legs running style”. On Sunday afternoon, this changed. Alec also complained that Isaiah had “poor rhythm” for an elite hurdler. Deactivated muscles can cause some weird things. The body finds a way to run fast with or without activation. Have you noticed how the best sprinters make high-speed running look smooth and effortless? Muscles that are in sync and activated produce symmetry and efficiency. Imagine running at high speeds with a deactivated left glute … I picture a herky-jerky crazy-legged sprinter with bad rhythm. When we went back inside, the strength testing showed the effectiveness of the activation. After glute activation, Isaiah was able to resist the entire body weight of Chris Korfist. Before activation, two fingers could easily push the knee to the table. Click to enlarge. The three of us couldn’t believe the transformation. We could see the difference in the strength tests with our own eyes. Alec sent head Edwardsville coach Chad Lakatos a video of Isaiah Michl’s new running form. The change bordered on miraculous. Isaiah Michl sprinting after activation. I love the drive of the knee and the back hand. The front foot is dorsi-flexed. The trail leg is a little “long in the back” but that’s an easy fix. Click to enlarge. I noticed the dorsi-flexed wrist here. Alec coaches his hurdlers to keep their wrists dorsi-flexed. Chris Korfist gave me this teaching point last summer. I have learned something new. Click to enlarge. Next, Chris Korfist gave Isaiah some self-activation techniques to be performed as he sat in class. Chris taught Alec how to test for activation and how to help Isaiah in the future. The sprint coach from the state champions (York) and the hurdle coach from the runners-up (Edwardsville) getting together to help a kid. Cool stuff. The 600-mile round trip was worth it. Click to enlarge. Chris Korfist learned it all from Douglas Heel. Douglas Heel is coming to Chicago on October 18 and 19th. He will teach “Be-Activated” from 9 to 5 on both days. The seminar will look something like this … video. I will be there. Chris Korfist will be there. Brian Weiss of Triad will be there. This is NOT a coaching clinic. For more information email korfist1@comcast.net. 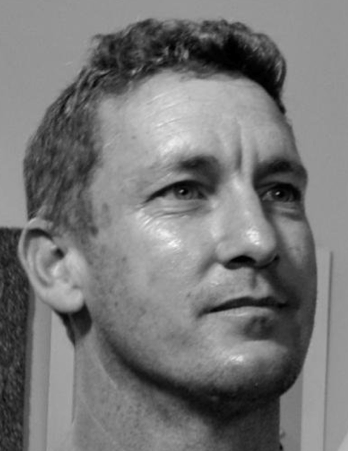 Douglas Heel is from Cape Town, South Africa. Chris Korfist hopes to bring Heel back to Chicago in February. 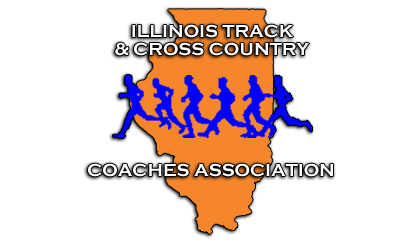 I know a couple of coaches from Edwardsville who are planning to attend. Here is an article written by Joe Kelly of Runners World about Douglas Heel and Be-Activated … article. I have not yet met Mr. Heel, but I look forward to it. @DouglasHeel now follows @pntrack on twitter … one of my top twitter achievements. Ha. Like everyone else, I have lots of regrets. I wish I could go back to 1999 and prevent Jesse Sais from pulling a hamstring at Glenbard West. I wish I could go back to 2009 and fix Robert Gilmore. Gilmore had no injury, but his hamstring would not allow him to sprint. Robert had hamstring issues that never went away. We had the best indoor 4×2 in Illinois but failed to medal at the 2009 state meet. I wish I could go back and fix Derick Suss. Suss missed his entire junior season and then blew up his hamstring in the finals of the 4×4 back in 2012. Maybe I could have activated Quintin Hoosman so he wouldn’t have missed his sophomore track season and half of his junior season. On a positive note, after getting “fixed” by Chris Korfist last spring, Quintin anchored our state-qualifying 4×2 team. Quintin was injured for six of our nine football games last year. This year, Quintin has 127 carries for 861 yards (6.8 ypc) in his first four games. I keep picturing a team of fast guys that don’t break down. Be-Activated may be a game changer. Sprint coaches need to get some sleep. Track Coach Plainfield North H.S. I’ve been asked whether Be-Activated is a “medical procedure”. I’ve also been asked if Be-Activated circumvents athletic trainers. The answers: No and No. Relaxation and muscle readiness (activation) is not medical. Coaches have been getting kids activated for years. Athletic trainers are free to treat athletes with ice, electric muscle stimulation, stretching, etc. Trainers can diagnose and deal with concussions. They can continue to tape ankles. Trainers can diagnose injuries and suggest x-rays or refer an athlete to a physician. However, athletic trainers have nothing to do with sprint mechanics or getting a kid activated to run at top speed. Hamstring is not the only problem with sprinters. You also have to look at the hip flexors as well. The athlete hamstring issue can be prevent. If the school’s have a quality sport personal trainers and strength and conditioning coaches as assess these athletes movements. He would run pain free with proper training and proper technique instead of run through pain which can cause injuries.